Brad Clancy, originally from the Washington DC/Baltimore area, started his musical career at age 16, doing club gigs gaining entry with his brother's ID. After a few years of slugging it out in the clubs, the calls began coming from main acts such as Little Anthony & The Imperials, The Drifters, Marvalettes, Steve Allen (Tonight Show Host)' and several other "Motown" era and oldies groups like Earl Speedo and the Cadillacs and Mary Wilson from The Supremes. During this time, Brad continued his drumming education. Driving to Northern New Jersey to study with Jazz legend Joe Morello. 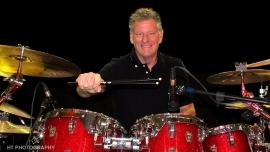 Brad credits a large part of his ability to play varied styles to friend and teacher Paul Wilson (most notably with Frankie Valli and the Four Seasons). In 1990 a drunk driver sidelined Brad for several years while doctors performed many surgeries to repair the injuries. 1995 brought a move to Nashville where although still undoing physical repairs, Brad made significant headway into the the Country Music scene. For a time while rebuilding his left arm and hand, Brad took the position fronting and singing all the songs for "Bill Haley's Comets". Joking about how tough it was to learn 19 songs on guitar in order to do the gig. Brad left the Comets when offers from Ricky Van Shelton and David Ball came along. Since that time Brad has worked, recorded and toured with many Country Artists including Doug Stone, Vern Gosdin, Nashville Star winner Buddy Jewell and many others. Brad has also enjoyed performing many many times on the Grand Ol Opry. Commenting on how exciting it was to get to work with Little Jimmy Dickens, Porter Waggoner, Vince Gill and all the artists that he got a chance to spend a little time with. You can find Brad now on the road with Blues /Rock guitarist Bobby Messano , Blues Hall of Famer and recipient of 26 first round Grammy nominations.